As I read this book in the run-up to Christmas, I wondered whether a more apt subtitle might be The greatest story ever told. It is a cosmic tale, linking the origins of the elements in the Big Bang and in the evolution of stars to the formation of increasingly complex molecules in the interstellar medium, and ultimately to the role that astronomical bodies and processes might have had on the origin of life on Earth and elsewhere in the universe. It is a story of immense timescales and distances, coupled to the atomic and molecular processes at low temperatures and densities that are controlled microscopically by the laws of quantum mechanics. Rehder’s task is thus a difficult one - to compress vast areas of astronomy, chemistry and biology into a book of reasonable length and content - and it is to his credit that he does so with some aplomb. He writes primarily for the chemist, but there are excellent summaries of Big Bang physics and nucleosynthesis in stars. The chemistry of the interstellar medium, which provides the meeting place for diverse disciplines, is described in some detail and the role of comets which may have brought prebiotic material, as well as a significant fraction of the oceans, to the early Earth is stressed. 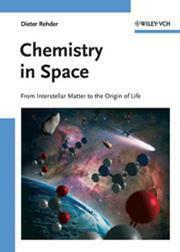 The book concludes with chapters on chemistry in the solar system, identifying its planets and moons that may have properties conducive for life, and on possible scenarios for the origin and emergence of life on Earth. Like The greatest story ever told, it can be short on details, but like that story, it can open one’s imagination to a different view of the universe and the importance of chemistry in space.